Sushi chef, Sake Sommelier, teacher, speaker, and author specializing in authentic Japanese sushi and Japanese cuisine and European cuisine. You are also welcome to follow me on Instagram: zoe_escher and check my facebook page. I am adopted from Sri Lanka and came to Denmark as a baby. I have lived entire life in Denmark and have over the years travelled to many European countries. Over the years I have enjoyed authentic European food and learned to cook European dishes. Ever since I was in my 20s, I have had a huge passion for Japan and Japanese cuisine. For many years, I have practiced the martial arts of kendo (Japanese sword fencing) at elite level. My kendo coach and mentor today is Nobuo Hirakawa, who is very famous in Japan for his ability to hand-pick talents and develop them into the best kendo players in the world. In 2004, I traveled to Japan where I was on a training camp in Tokyo. After training, I was invited to dinner with the teachers at one of the many good sushi restaurants. – It was an eye-opener. Japanese sushi has much more taste, and typically, Japanese sushi restaurants have 20 different kinds of fish on their menu. In 2005, my knee was injured, so unfortunately, I had to give up practicing kendo. But my joy of the beautiful country and culture of Japan and my enthusiasm for Japanese cuisine remained unchanged. In 2006, I traveled to Los Angeles where I was trained to become a sushi chef and Sake Sommelier at the California Sushi Academy. As part of the training, I also learned to make different appetizers, entrees and other classic dishes within the Japanese cuisine. – The course was led by the highly acclaimed Japanese director Toshi Sugiura, who has 40 years of experience, is a celebrity chef in Hollywood and a judge at sushi competitions in Japan. During my stay in Los Angeles, I made catering at celebrities’ houses in Bel Air, Beverly Hills, and Brentwood, as well as at film companies in Hollywood. My delight of Japanese cuisine and sushi has meant that since 2004, I have traveled to Japan almost every year to be inspired, learn new techniques, and broaden my horizons within Japanese gastronomy. – In addition, it is also a nice opportunity to visit Japanese friends and instructors and train kendo kata. Since I graduated in 2006 I have been quite busy. On 9 July 2010, my cookbook “Matcha, omakase and sushi” was released. I also do exclusive pop-up sushi dinner and private dining. In February 2016 I held the official opening speech and opened the fair Formland Spring 2016 in Messecenter Herning in Denmark. At the opening of the fair there were 49 people from the press, 20 VIP and 271 exhibitors. 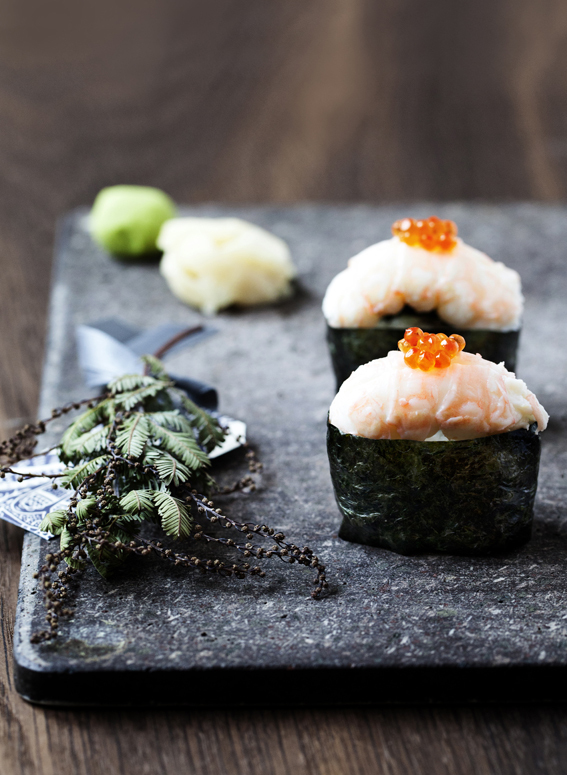 In October 2014, I made a sushi guide for the newspaper Jyllands-Posten which can be found on their website. In August 2014, I rated the quality of take-away sushi from 8 different sushi restaurants in Copenhagen. A research made by the consumer council magazine “THINK”. 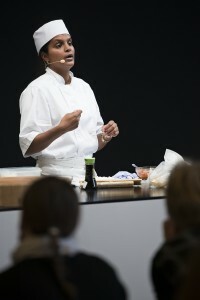 My sushi course for beginners was nominated for the Danish Experience Prize 2013. In November 2013, I was rated as sushi expert no. 1 in Denmark by the gourmet supermarket chain Irma. In November 2013, I made sushi and other Japanese cuisine dishes as staff food for the three-star Michelin restaurant Geranium. I was born in 1974 and adopted from Sri Lanka. I grew up with Dutch parents, and I am the granddaughter of the internationally renowned Dutch artist M.C Escher. I live in Copenhagen and have no children. Besides gastronomy, I am deeply interested in self-development and exercise, I enjoy traveling, and of course I enjoy Copenhagen all year round.